The American middle-class ideal was forged in the decades after World War II, when economic growth and wage increases climbed in lockstep for nearly 30 years. That pairing dissolved abruptly in the 1970s. Between 1973 and 2017, according to the Economic Policy Institute, the productivity of the economy grew 77%—but average compensation rose only 12.4%, adjusted for inflation. In the 1930s, concentrations of wealth and a diminishing middle class exacerbated the cruel impact of the Great Depression. The recent announcement by the founder of Amazon, Jeff Bezos, that his company would give substantial raises to its lowest-paid employees should not blind us to the fact that most American workers are not receiving big wage increases. Forty, fifty or even sixty years ago, mention the phrase “working class” and most folks understood that to mean “blue collar” laborers such as a machinist, waitress, plumber, cop, production line worker, or housekeeper. 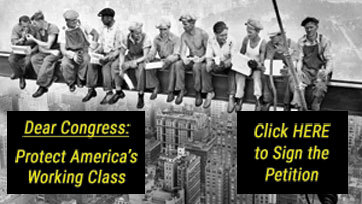 Sign the petition telling Congress to stop the war on the working class. This interactive timeline includes all actions taken by the 116th Congress on Social Security, Medicare, ACA, and Medicaid. The movement in Washington to gut our most crucial social insurance programs – not only Social Security and Medicare, but Medicaid, too – amounts to nothing less than a war on the working class: people at all levels of income and employment who are counting on retirement income and health security. GOP talks of of targeting our earned benefits and health care in 2019. From the pages of his own book to the public statements made by President Trump and members of his campaign or administration, theirs is ample evidence that this administration poses a great threat to the future of the earned benefits and other tax payer funded programs that keep workers, seniors, the disabled and their families financially stable. Coast to coast, we are on the air talking about legislative efforts, public opinions, campaigns and more. We record and save as many broadcasts as possible so that you can listen anytime. Browse our archive of Letters.